I talk about the damage Old Man Winter can do to your home a lot because it can have a serious effect on your home’s ability to keep you warm and safe. And while I’ve covered your basic to-do list when it comes to your regular spring maintenance, I wanted to get a little deeper with a subject I’m asked about a lot. I’m talking about how to make your home more energy efficient, to keep your air conditioner from working overtime when late spring and summer hits. Drafts can be responsible for up to 30 percent of a home’s temperature fluctuation - meaning if you’re letting little drafts in here and there, keeping your home at a cool, comfortable temperature makes your HVAC work overtime when Mother Nature really turns up the heat. What’s one of the simplest ways to make your home less drafty? Start with a walk around the outside of your home, checking your doors and windows for air leaks. A good visual indication of this is any broken or missing caulking and weather stripping around your doors and windows. If you suspect your air leakage problem goes beyond what you can solve with new caulking and weatherstripping, a licensed home inspector with a thermal imaging camera can help you detect the spots in your home that are losing the most heat and recommend solutions to make your home more energy efficient. But let’s start with your doors and windows. Keeping an airtight seal around your doorways goes a long way to keeping your home at a comfortable temperature. 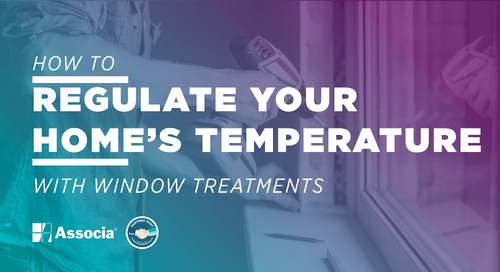 The good news is, replacing weatherstripping is a pretty simple job that you can probably handle on your own. Felt is easy to install and a pretty inexpensive choice, but not super durable. You’ll need to be prepared to replace it every few years. V Strips are plastic or metal strips that can be peeled and stuck into the sides and top of the door. When installed properly (you can add finishing nails for extra security), they will be pretty durable. Foam Tape weather stripping comes in a variety of widths and thicknesses, so if you’ve got an oddly sized door crack, foam tape makes a good choice. When installing new weatherstripping, take out all of the old material and cut your new chosen material so it will properly fit. Then fasten to the top and sides of your door. Once the top and sides are sealed close your door completely, look along the bottom for any light peeking through, or feel for any drafts coming in. If you feel a draft or see light peeking through, you will also need to install a new door sweep, which is a flat piece of plastic or metal that’s fit with nylon, vinyl, or a brush that will fill the space between the bottom of the door and your threshold. As with your doors, you want to look for instances of broken and missing caulking around your windows that are letting those costly drafts in. You don’t want to place new caulking over the old stuff. Scrap it all away completely, clean the surface with rubbing alcohol, and wipe it down with a cloth. Once the area is clean and dry, install the new caulking. Make sure you use caulking that’s designed for outdoor use - ideally you want something that has the ability to expand and contract with the home, so it doesn’t break up with the natural movement of the structure. I’ve been using Sika Boom on our job sites lately, which is a low-expansion, polyurethane foam that offers great weather sealing, and gives you some insulating power. As a bonus, you can use it year-round, even in extremely cold conditions (perfect for my Canadian winters). And once you’ve checked all your windows, don’t forget to look at the openings around any pipes that exhaust to your exterior and caulk around larger gaps surrounding your pipes. This has the added benefit of keeping insects and small critters from sneaking into your house to wreak havoc, too.